At Queen Mary's local health and social organisations are working together to ensure a bright future for the hospital. We are investing around £30million over the next three years to modernise the buildings and bring services up to date. By 2016 Queen Mary’s will become one of the first 'community-facing' hospitals of its kind in the country, with a joined-up approach to local health and social care services, that will transform the way in which we deliver care to our patients. The exciting and innovative changes underway will ensure that patients receive high quality healthcare services that are sustainable, and will improve health outcomes and patient experience for the people of south-east London. 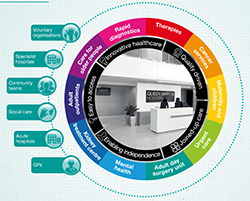 This interactive graphic outlines the services that will be provided at Queen Mary's and the core principles driving the design of these services. We are keen to hear your views and keep you informed of the exciting ways in which we are transforming our estate to enable us to deliver high quality care for local people. Have your say and let us know what you think – complete our short survey - about the changes taking place. With your help we can transform Queen Mary’s and secure a bright future for it. If you want to get involved and help design local health and social care services you can contact the patient experience team at NHS Bexley Clinical Commissioning Group on 0800 328 9712 or contactus@bexley.nhs.uk.